Laura soon found herself immersed in the community through volunteer work. She even began making wine herself, using grapes from friends’ vineyards, and she’s since won awards for her Merlot, Syrah, and Pinot Noir. About one year ago, 101 Wine Tours was born. Paso Robles was dubbed Wine Enthusiast’s 2013 Wine Region of the Year, but the area’s viticultural history goes back for centuries. In the 1700s, when Paso Robles was still Mexican territory, Franciscan monks planted grapes to make altar wine. 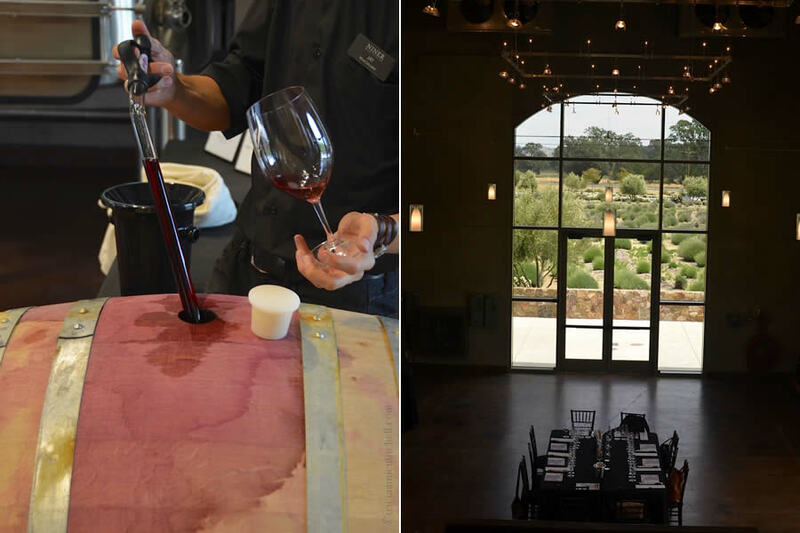 About a century later, Paso Robles’ commercial wine industry was burgeoning, and by the 1980s, boutique wineries started taking root. 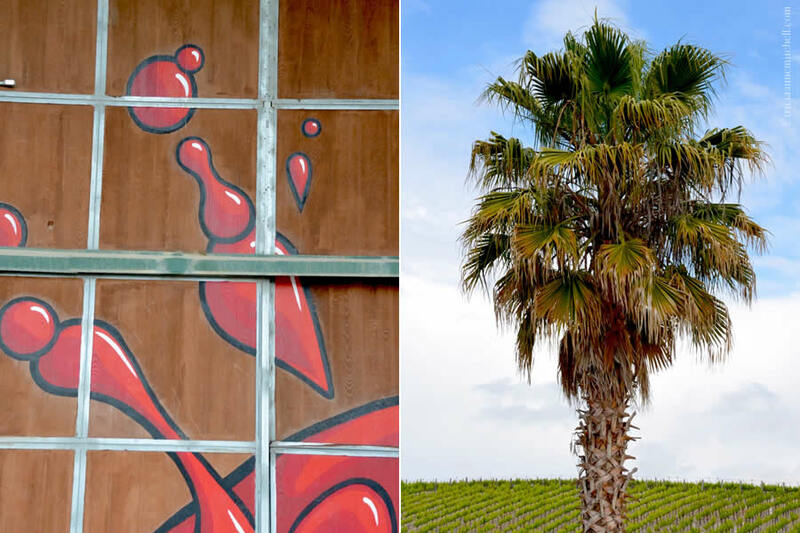 Today, Paso Robles is known for fostering an unconventional spirit. The region boasts more than 200 wineries and 11 viticultural areas, or appellations. 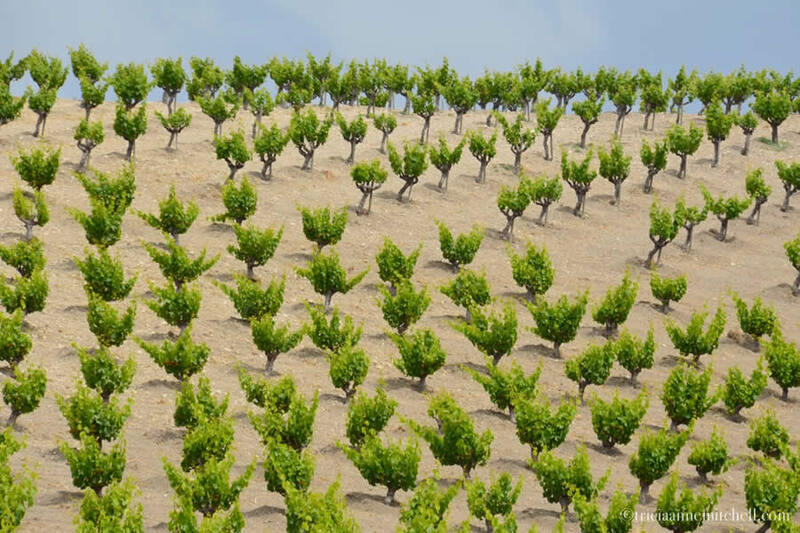 While Paso’s climate and soils allow winemakers to cultivate more than 40 varieties of grapes, French, Italian and Spanish varietals favor heavily on wine menus, as do California favorites like Zinfandel and Petite Sirah. 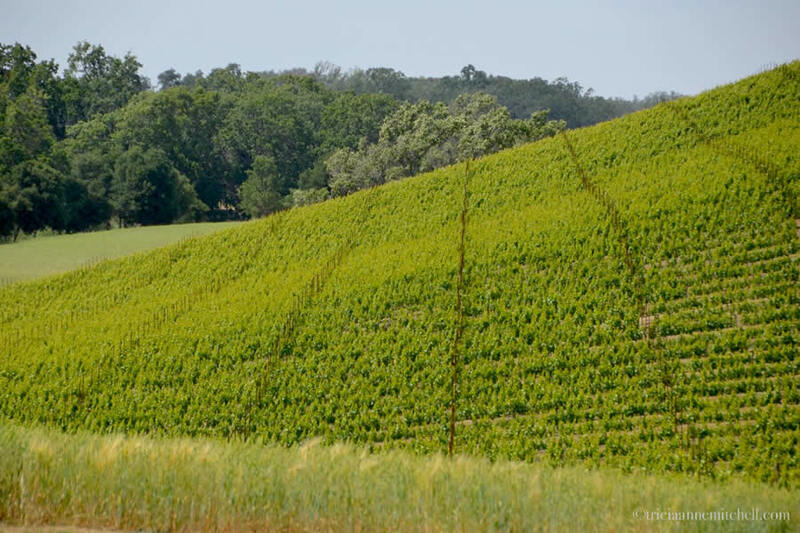 Many varied microclimates exist in Paso Robles, thanks to the region’s proximity to the Pacific Ocean, and the presence of valleys, canyons, and different elevations. 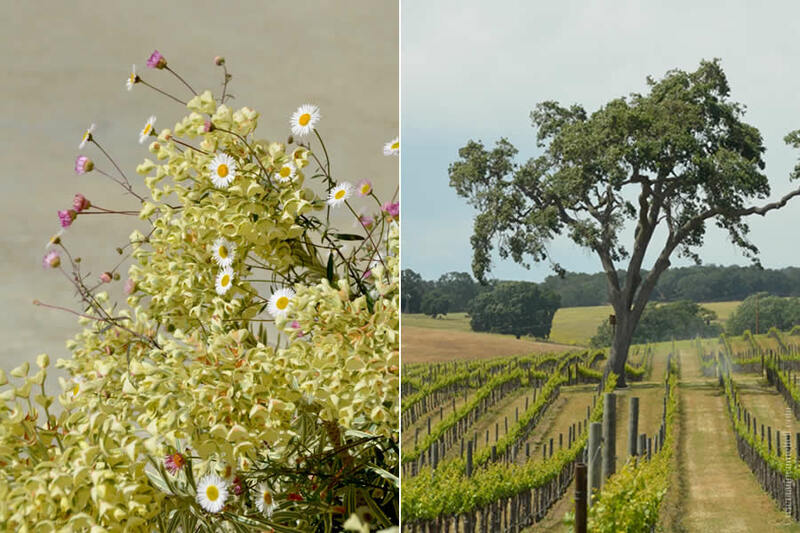 A vineyard’s proximity to the Pacific makes for varied soil-types and rainfall amounts. The climate is characterized by cool nights and warm to hot days. Our first stop was Turley Wine Cellars. Focusing on old-vine vineyards, all of Turley’s vineyards are certified organic, or in the process of becoming so designated. 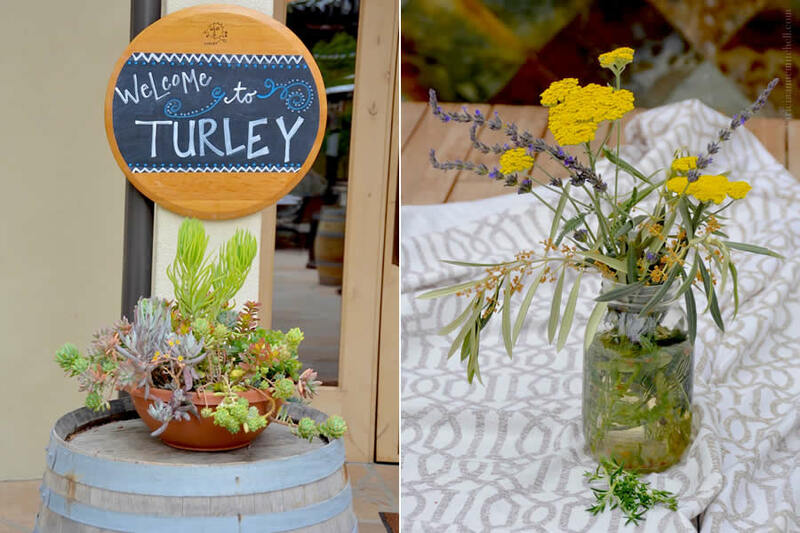 Turley’s grapes come from vineyards across California, including Paso Robles, Napa, Sonoma, and Lodi. Steve, who is extremely knowledgeable about wine-making, but at the same time very approachable, walked us through wine-tasting principles, highlighting that most of what we think of sense of taste is really sense of smell. Incredibly, we can distinguish about 10,000 different aromas! 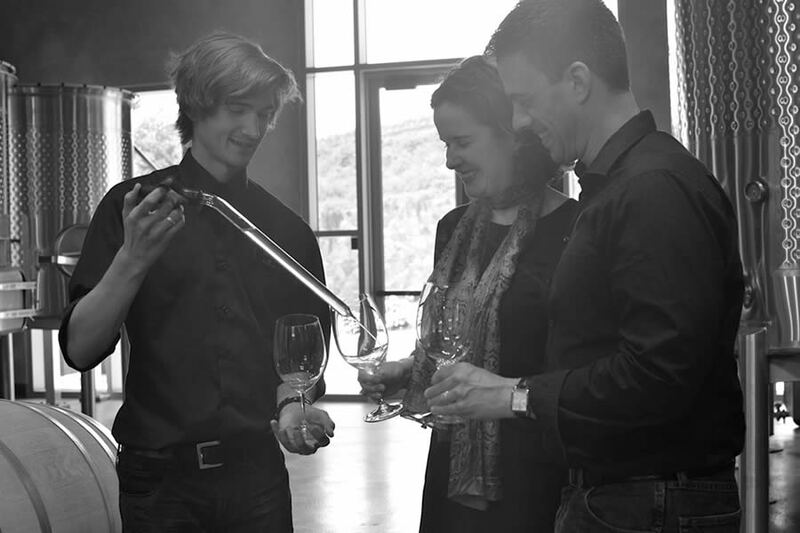 One of our fellow tasters expressed how he found it challenging to distinguish a wine’s complex aromatics. That’s where Steve chimed in, challenging us to develop our noses. 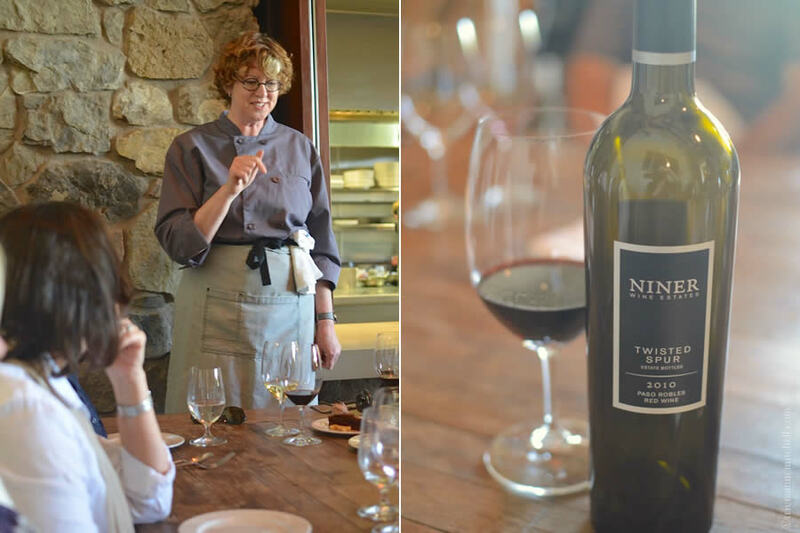 As Turley specializes in Zinfandel and Petite Sirah, it’s fitting that our tasting focused on the former, something that we found quite enjoyable since we’d spent about four months in the Zinfandel grape’s ancestral homeland of Croatia in 2013 and 2014. 2012 ‘Old Vines’ California Zinfandel. Tasting stop number one: Turley Wine Cellars, which produces Petite Sirah and Zinfandel from some of California’s most-historic vineyards. This vineyard’s grapes are head-trained, or ‘bush vines.’ Our Turley host, Steve, explained that this type of vine training is well suited to Mediterranean climates. Our well-versed and patient host at Turley, Steve. 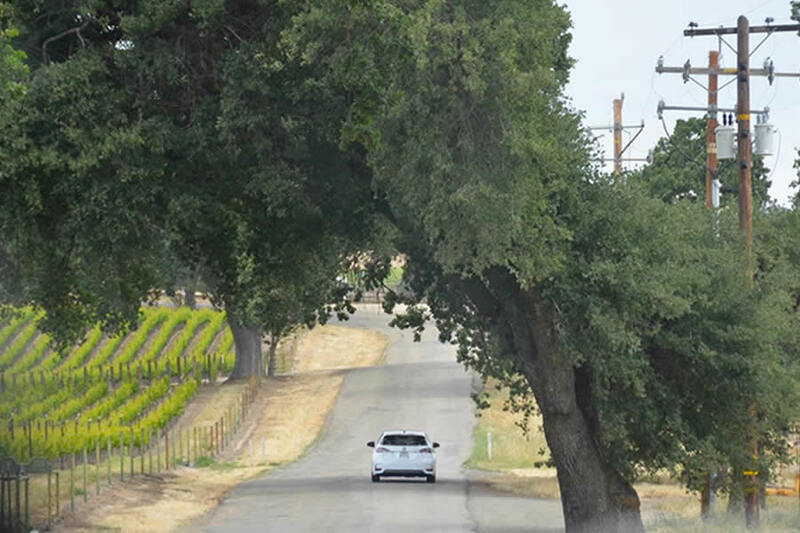 The countryside of Paso Robles is quite attractive: golden rolling hills, and Cypress, Palm and Oak trees, with the scent of Pines and Rosemary in the air. We also spotted longhorn cattle, wild deer, and turkeys. Bear-crossing signs reminded drivers that other furry friends lurk in the wooded areas! 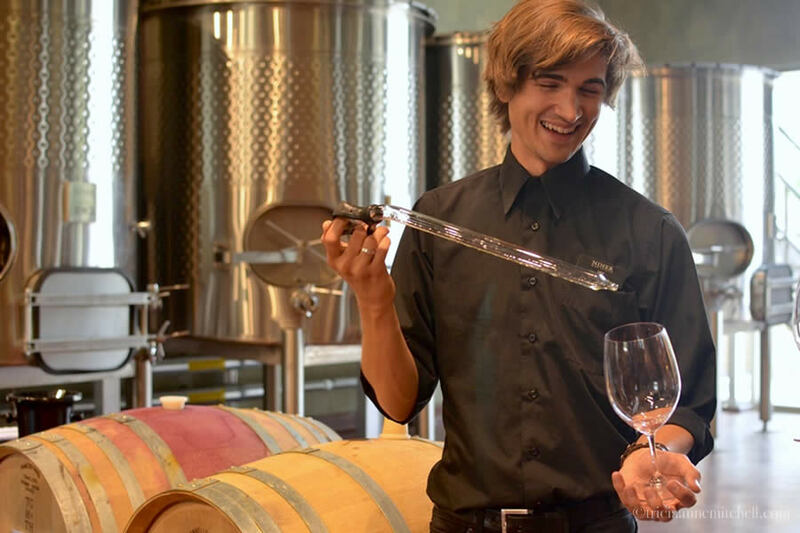 L’Aventure’s winemaker, Stefan Asseo exemplifies the Paso Robles spirit of nurturing innovative winemakers. Educated in Burgundy, France, L’Aventure’s proprietor found himself constrained by France’s strict winemaking rules, and the inability to make certain blends. 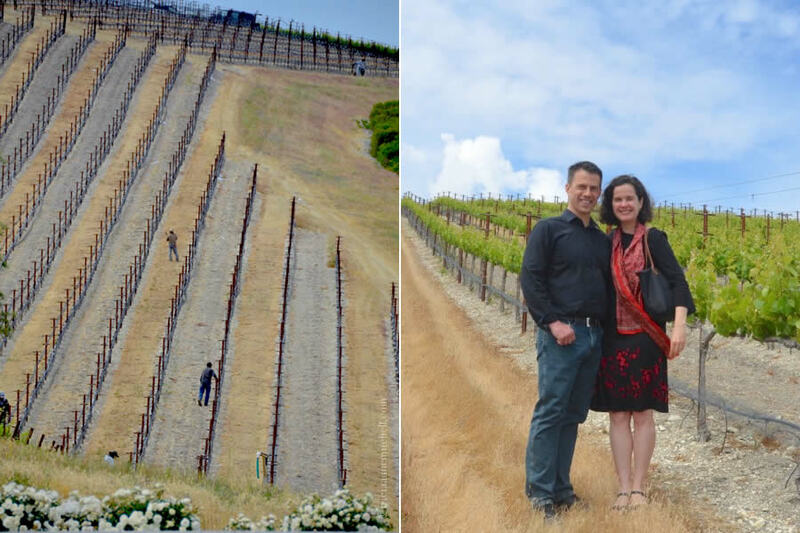 After a worldwide search for the perfect place to plant roots, he and his family decided upon Paso Robles. 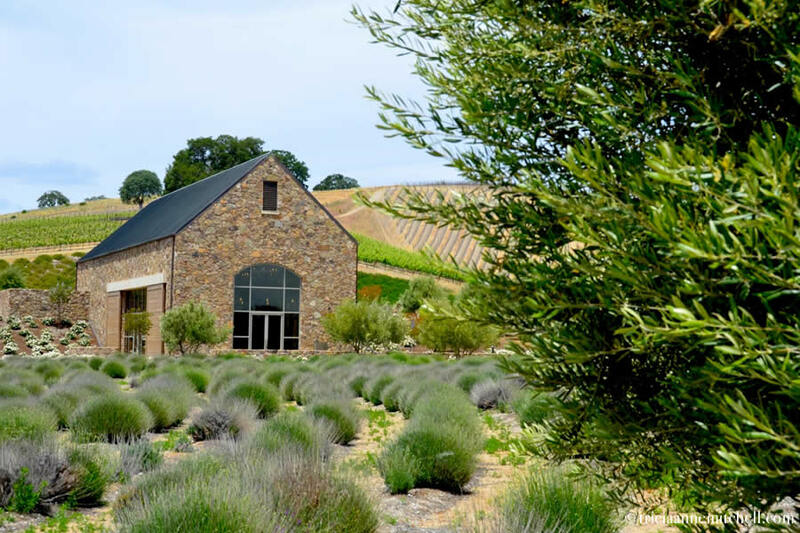 Martin, the tasting room associate, noted that L’Aventure’s dense-farming method creates competition, in turn adding complex traits and tannins to the wine. 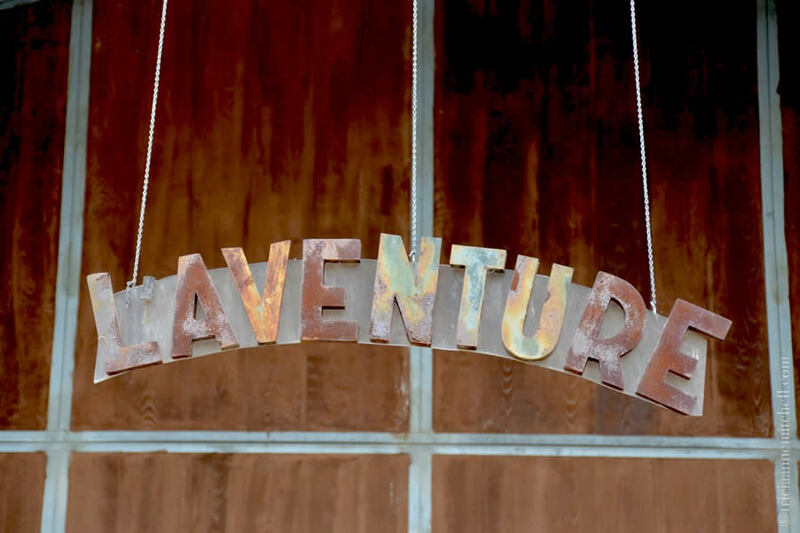 Tasting stop number two: L’Aventure, which was founded by innovative French winemaker, Stefan Asseo. 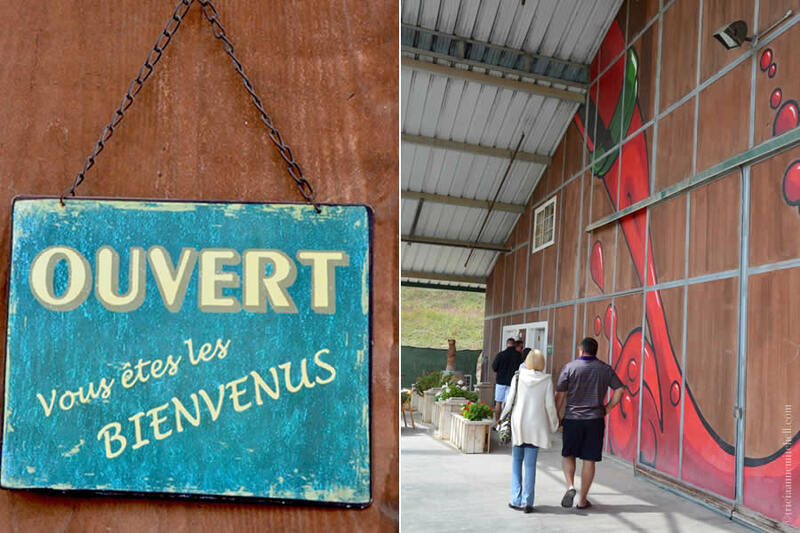 A French sign welcoming visitors mingles with a splash of more abstract art. 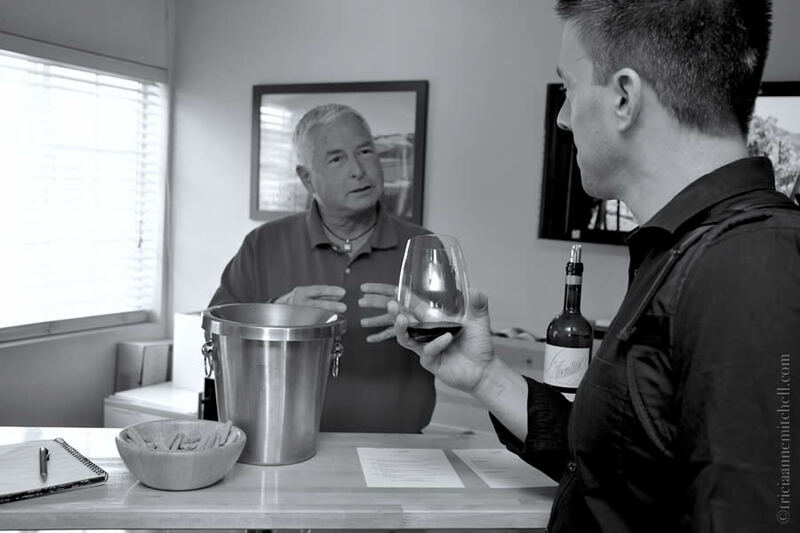 Martin, the tasting room associate, provides details for L’Aventure’s Optimus 2013, a wine made with Syrah, Cabernet Sauvignon, and Petit Verdot grapes. 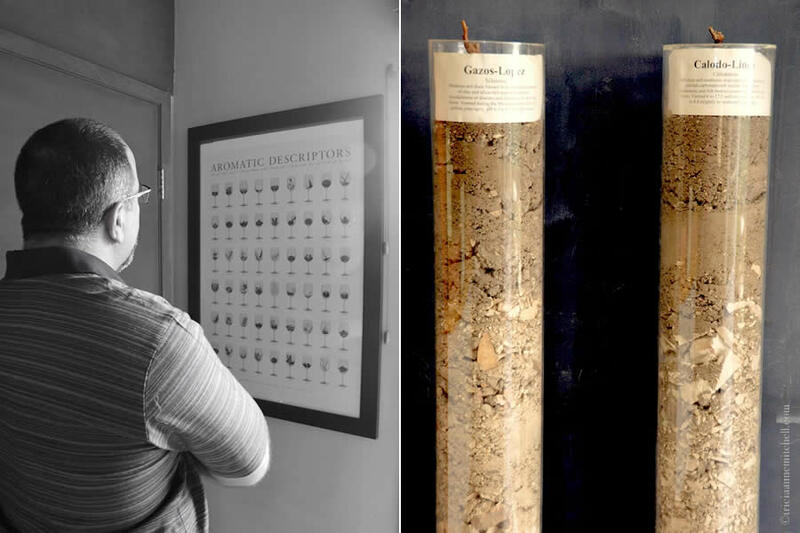 Visual aids highlight wines’ varied aromatics (left), as well as the type of soil composition that makes up L’Aventure’s vineyards. Driving onto the Niner Wine Estate grounds, I felt for a second that I had been transported back to Europe. Though the estate’s buildings are new, the stone façades, coupled with white roses and lavender about to bloom, gave the grounds a lovely feel. 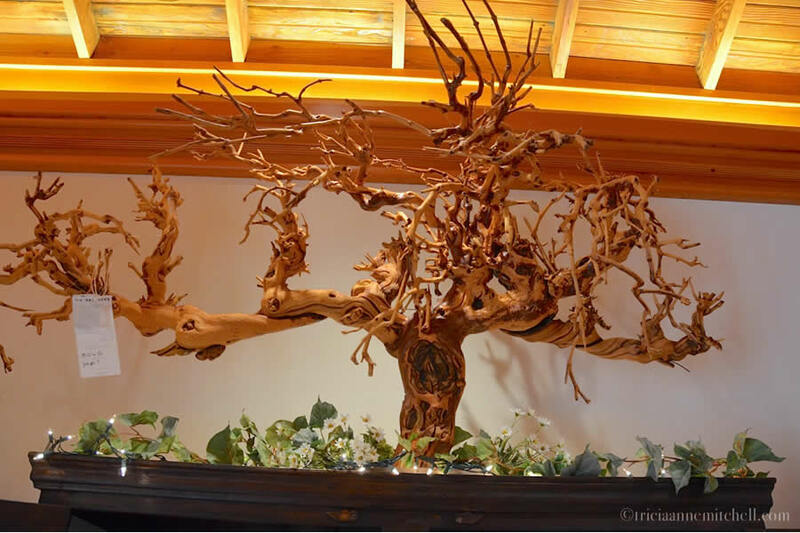 I also found myself taken by the beautiful displays illustrating various wines’ complex aromatics, with everything from red licorice, to marshmallows, citrus fruit and flowers populating a series of wine glasses. 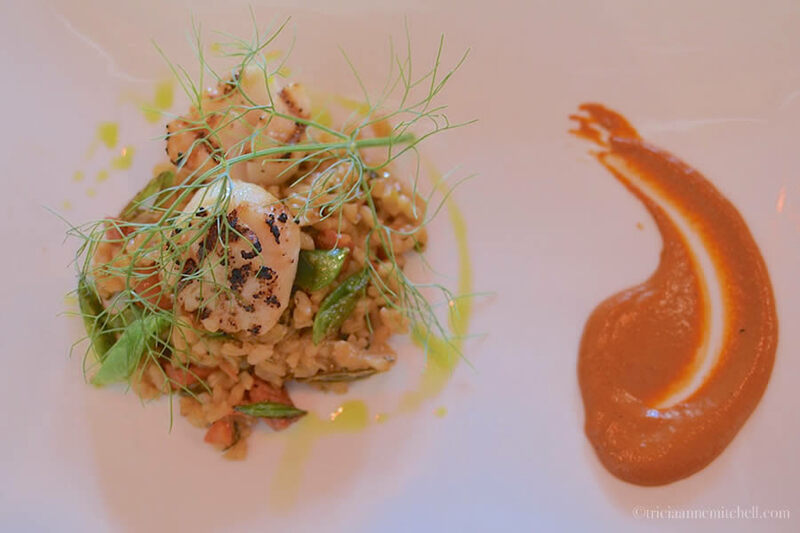 First, we enjoyed lunch, with me savoring a light dish of Scallops with Paella, Peas and Romesco. Shawn feasted upon Spring Lasagna with Ricotta and Poblano Peppers. I’m still dreaming of the Spanish-inspired Romesco sauce that was fashioned into an enticing swirl on my plate! 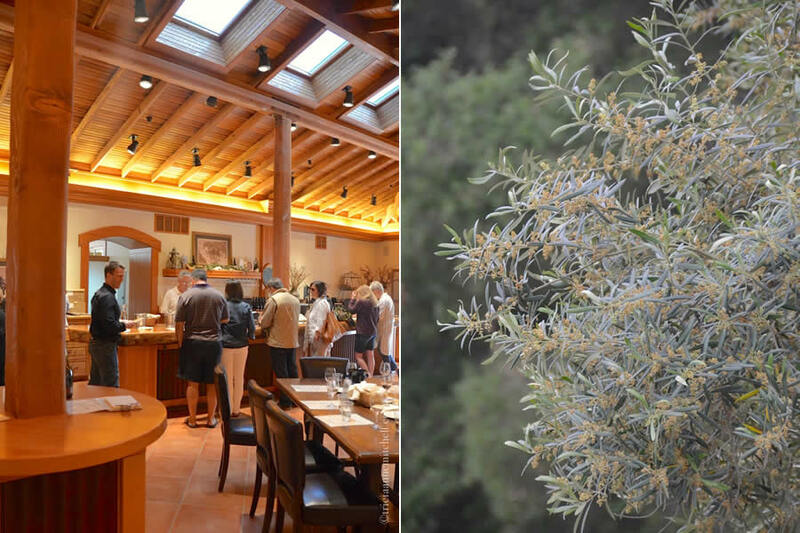 The lunches were nicely paired with bottles of 2013 Sauvignon Blanc and 2010 Twisted Spur. 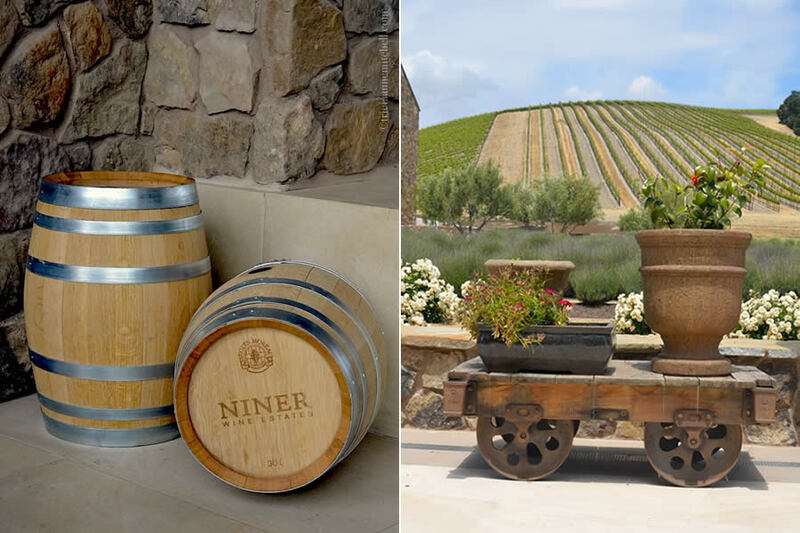 Led by enthusiastic Jay, one of Niner’s wine educators, we meandered to the barrel-tasting room where we sampled a white and red wine straight from the barrel, followed by a more complete tasting flight. Tasting stop number three: Niner Wine Estates, which produces wines from vineyards in Paso Robles and Edna Valley. I’d love to return when this Lavender is in full bloom! 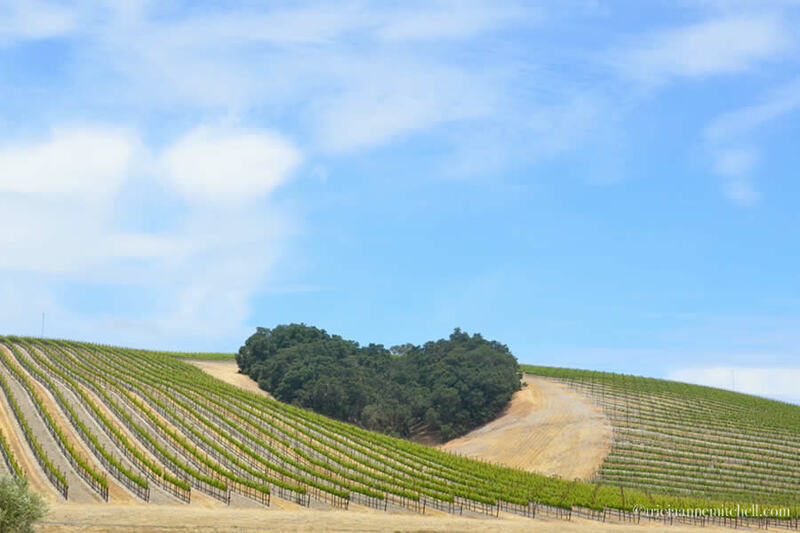 Heart Hill Vineyard, made up of Coastal and Blue Oak trees. After two rounds of tastings, this lunch was much anticipated! I enjoyed Scallops with Paella, Peas and Romesco. The slightly smoky Romesco sauce was especially memorable; I’d love to try and recreate it at home. 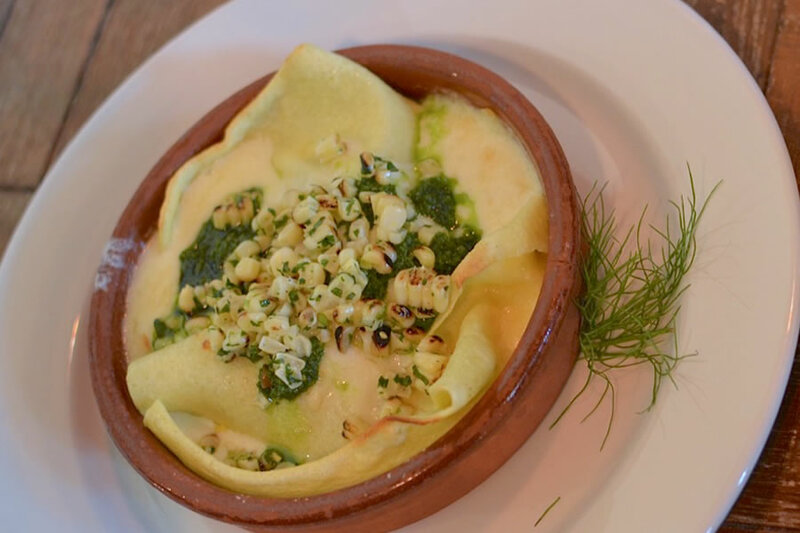 Shawn’s dish: Spring Lasagna with Ricotta and Poblano Peppers. Chef Maegen walks us through the cake, berry and creme desserts that have just arrived at the table (left). On the right, a 2010 Twisted Spur, made with Merlot, Petite Sirah, Syrah, and Cabernet Sauvignon grapes. 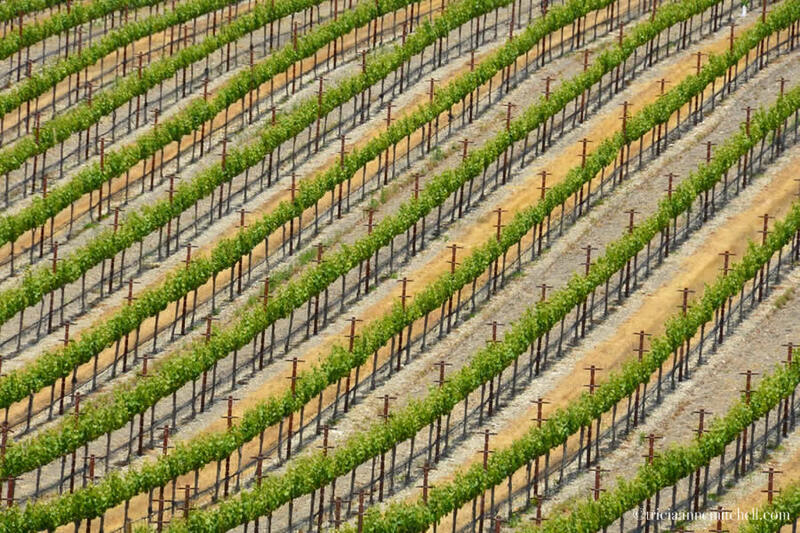 Niner’s vineyards, trained into a vertical-shoot position. 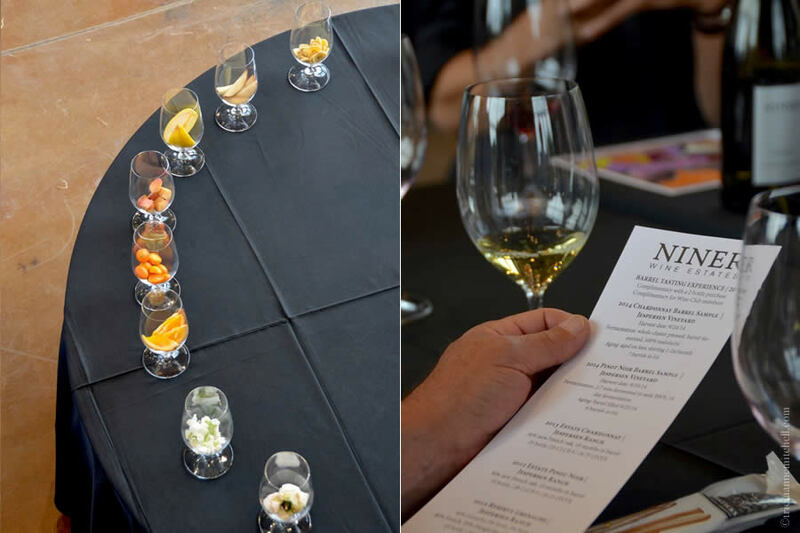 I really enjoyed Niner’s aesthetically-pleasing displays which focused upon wine’s varied aromas and tastes (left). Depending upon the type of grape, everything from flowers to fruit slices, to candy and shredded coconut were on display. One of Niner’s wine educators, Jay, delivers some Chardonnay, straight from the barrel. Our group, feeling dandy after a barrel tasting, poses with 101 Wine Tours founder and owner, Laura (far right). 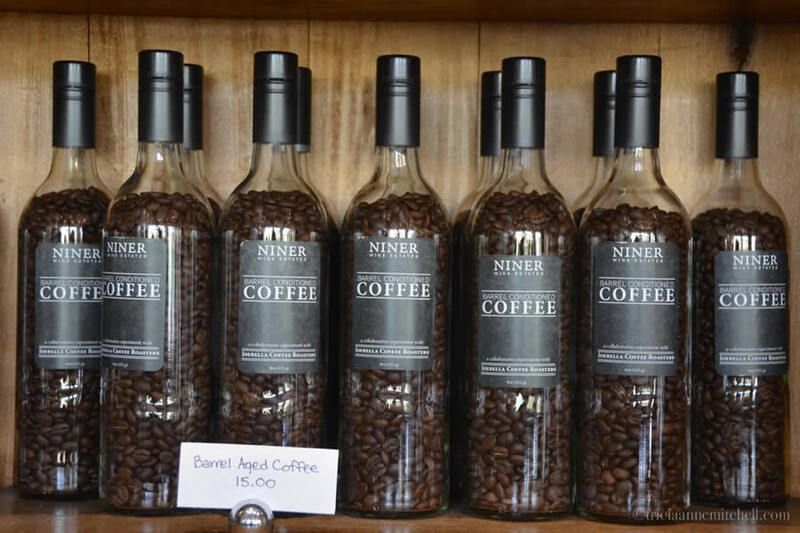 While we didn’t get to try it, we were intrigued by what this barrel-aged coffee must taste like! 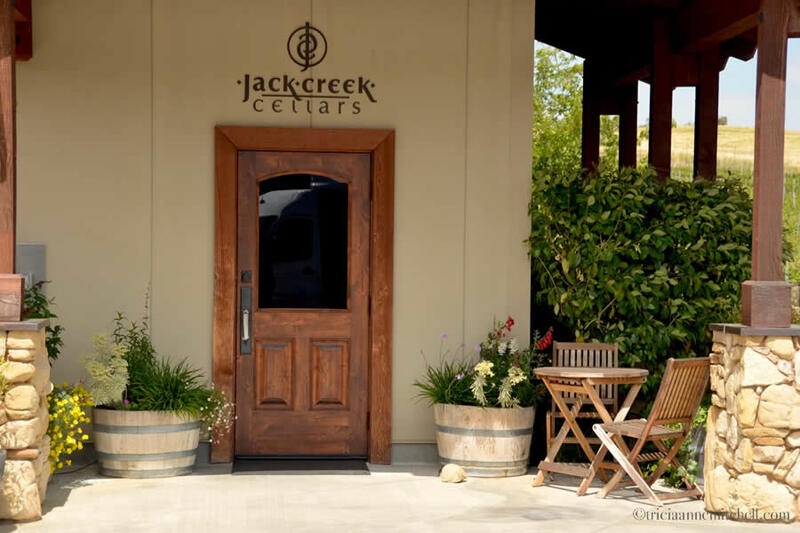 With an intimate tasting room, and staff members clad in flannel tops and cowboy boots, Jack Creek Cellars instantly presented a relaxed ambience. Jack Creek’s grapes are grown in a cooler microclimate, thanks to the vineyards’ proximity to the Pacific Ocean. 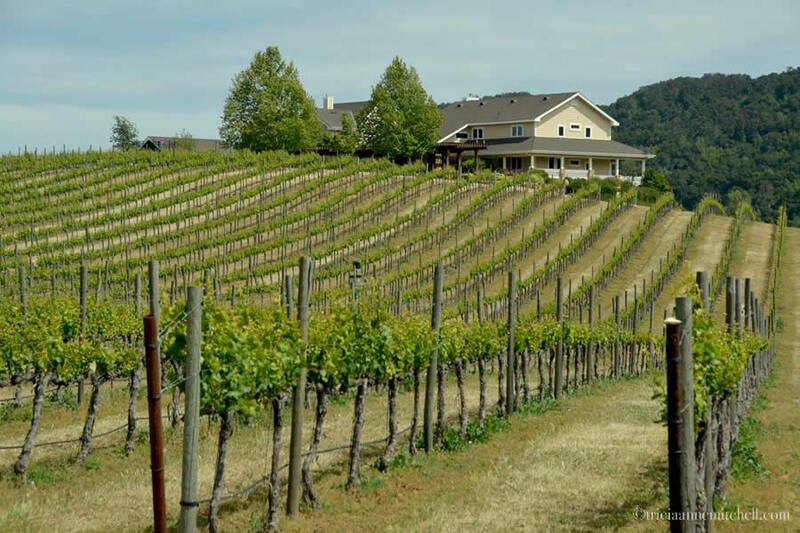 The family-owned winery focuses upon Pinot Noir, Syrah, Grenache, and Chardonnay varietals. With energetic Michelle at the pouring helm, we had a fun final tasting. 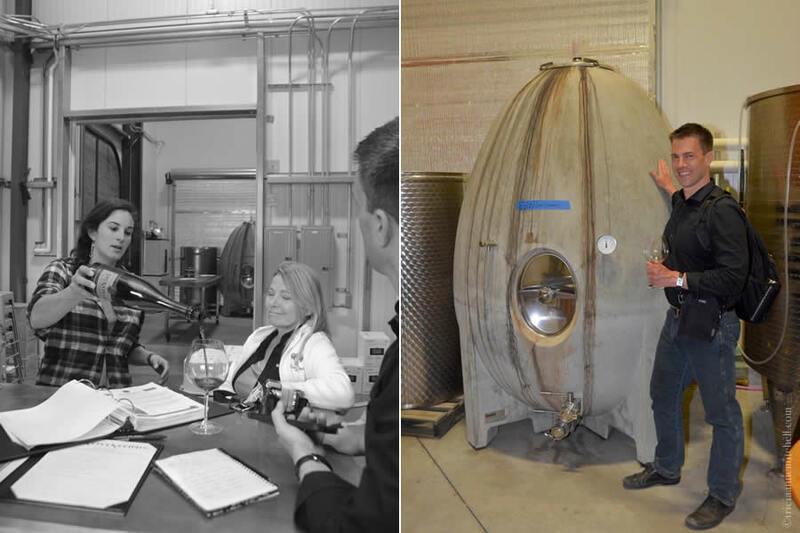 Our interest was especially heightened by Jack Creek’s use of a concrete egg to ferment and age select types of wine. Concrete has been used in winemaking since the 1800s, but this was the first time we’d tried wine made in such a manner. We appreciated the Grenache’s slight mineral notes, smooth nature, and fruity, but not overpowering quality. Jack Creek has done a concrete-aged Chardonnay too – dubbed the Concrete Blonde – but it was sold out. Tasting stop number four: Jack Creek Cellars, a cozy boutique winery. Lively Michelle pours me a glass of Pinot Noir to sample (left), and Shawn stands by Jack Creek’s concrete egg (right), which was used to ferment select types of wine. Concrete is appreciated by some winemakers because it helps wine maintain a more consistent temperature. It has been used for winemaking since the 19th century. Laura relayed the fun tidbit that Jack Creek’s staff dresses the egg in Easter decorations. Paso Robles wine country is located about 25 miles (40 kms) from San Luis Obispo. The region is ideally situated between Los Angeles and San Francisco, near the beautiful Central California coastline. Laura, the owner/founder of 101 Wine Tours, picked us up from San Luis Obispo. 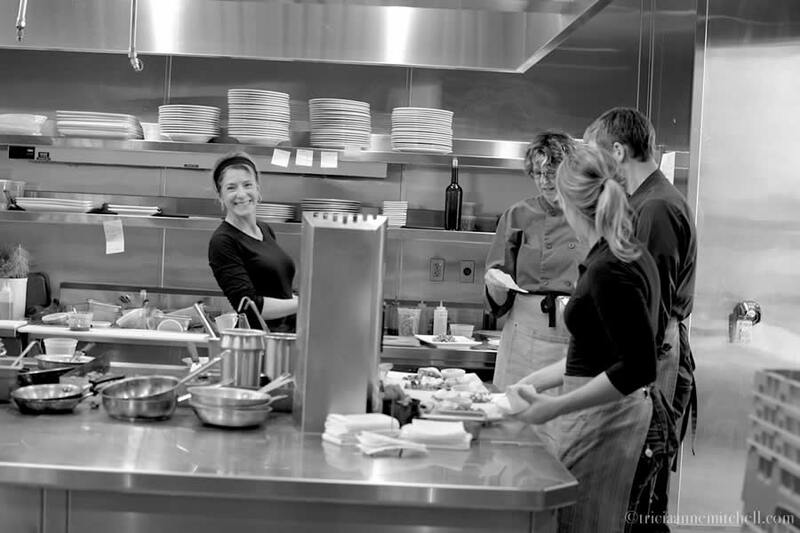 She leads personally-tailored tours in San Luis Obispo, Santa Barbara and Paso Robles. She asks that guests preferably book in advance and she’s even done multi-day tours with international visitors. For a map of Paso Robles wine country, as well as event details, see the Paso Robles Wine Country Alliance or the Paso Robles Chamber of Commerce. 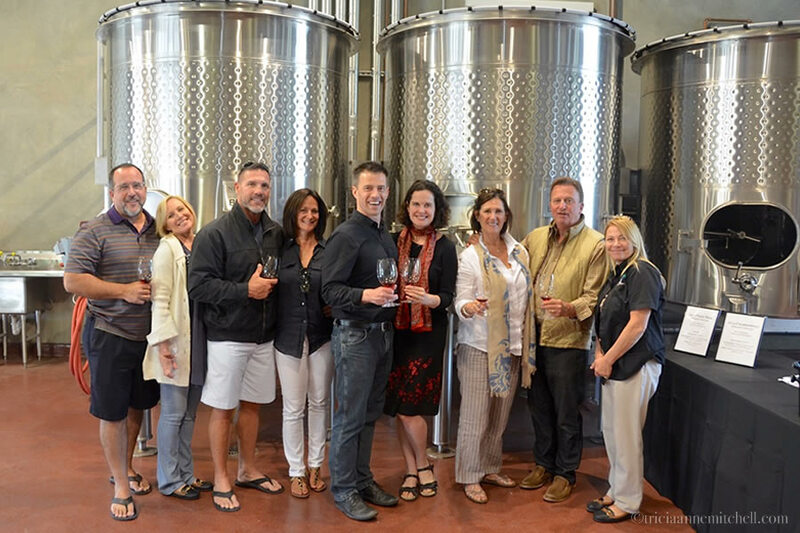 101 Wine Tours hosted us on this day’s excursion to Paso Robles wine country. We were provided the wine tastings at Turley, Niner, and Jack Creek. We’d like to extend an extra special thank you to Laura for providing so much insight into wine country in San Luis Obispo and Paso Robles, and for getting us to these various locations happily and safely. Thanks for the lovely wine tour and introducing us to the folks of Paso Robles. This should be linked to the local chamber of commerce website. They would benefit from your blog. I only wish I were on my way to California. Traveling Light, thank you for the kind words! I’m always hopeful that deserving destinations might be visited more as a result of my write-ups, and this part of California is no exception. With wine country, and the beautiful coastline (the idyllic Highway One drive too) not far from each other, it’s a special part of the world. We found it hard pulling ourselves away from San Luis Obispo, which we used as our base of operations. Here’s hoping you may soon be on a road leading to California. :) Thank you for reading, and for your comment. That was a wonderful tour. Your pictures are beautiful. Now I’m going to have a glass of wine. Gerard, pleased to hear that you enjoyed the glimpse of Paso Robles. After exploring some wine country in the Old World, it’s fun to see more of the New World’s wine-making regions. We’re toasting to you from afar. :) Hope you have a wonderful Sunday afternoon. I also love good wine! By mistake we think (at least until twenty years ago) that in Europe alone are vinified exceptional wines. Nothing more wrong. I tasted very good wines in Chile and Argentina (I do remember the Cavas de Weinert at the foot of the Andes). Also in South Africa I was impressed by the superior quality of their wines (a visit to the winery Boshendal is a must). When at home, sometimes we like to taste some wine that comes from other areas, and when we go some where else on vacation, is always a must to try out the local wines. Sorry, but I did not understand what the guy at Turley’s wine cellar meant by the “importance of stressing vines” .. or the method used to stress it, it seems to me something so strange! As always, I adore your photos! Nice to do every now and then a walk with you along known (or unknown) rutes. By the way the little fellow Cocoa is doing just great! He is a cuddly and do not lose the opportunity to be caressed. A dear affectionate greeting from all of us! Dear Claudine, thank you for your thoughtful comment and for sharing your experiences enjoying South American wine! Shawn and I have yet to get there, or South Africa together, but we hope to do so someday soon. Until then, we’ll have to live vicariously through your tales. Regarding the ‘stressing’ of the grapes comment that Steve at Turley Winery shared, I know that it sounds like a counterintuitive technique. :) A stressed grapevine might receive less water, nutrients, sunlight, etc. As a result, the vine focuses its energy on grapes, not leaves. This can result in better wine. Thanks for asking so that I could attempt to clarify! Winemaking sure is an art, and we learn something new every time. If the wine in your region is anywhere as good as the one you shared with us last November, we’re quite eager to try it! We were just telling the story of Cocoa yesterday, and wondering how you all are, so your message comes with perfect timing. Hugs to all. Darlene, since Shawn’s lasagne had gluten I didn’t get to try a nibble, but he acted as my tastebuds and said it was tasty. 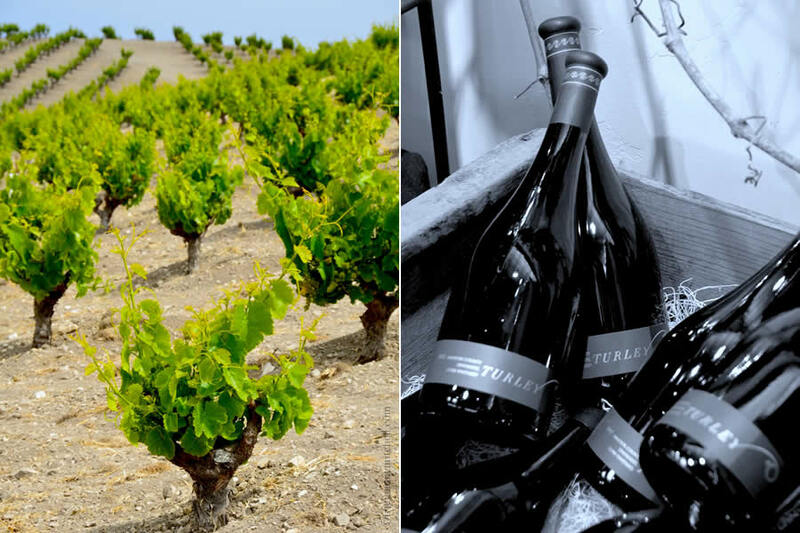 Here’s hoping you had a chance to enjoy a wonderful glass of wine earlier this afternoon – a Spanish one perhaps? :) Do you have any favorites there? 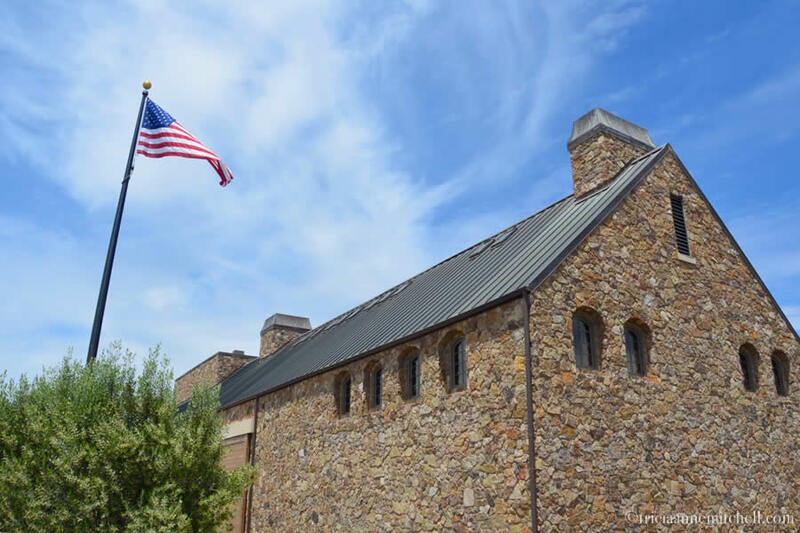 Having been to Paso Robles many times, I enjoyed reading your blog on the area. We live only about 200 miles from Paso, so we’re fortunate enough to be able to travel there in our motor home at least a couple of times a year, mainly to visit the wineries. The wineries you write about are new to us and you made them sound very appealing, so we’ll definitely visit them when we go back in July. Your photos are beautiful. Hi Hope, lovely to hear from a new reader, and I appreciate your kind words about the photography; thank you. 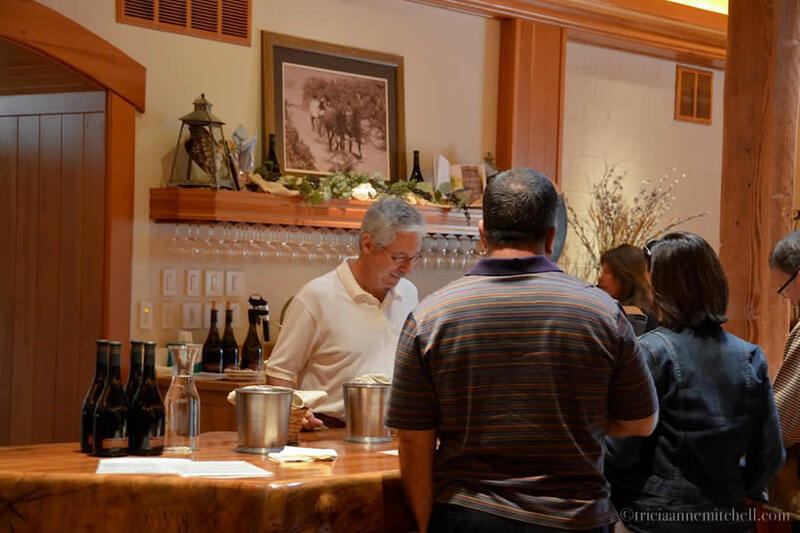 :) Since you’re a Paso regular, can you share some of the wineries that you enjoy visiting? How fun that you can make regular pilgrimages to California! le tue foto sono come un racconto,belle veramente!!!! Grazie per le gentili parole! La campagna Paso Robles ‘è certamente bello. I can see why this has been dubbed the happiest city. Just look at what it has to offer regionally. Absolutely beautiful and informative post, Tricia. I know nothing of the area or the wines described, but I feel like I just went on the tour. Maybe someday, the real thing. Your photos of sunny days and beautiful vineyards are so enticing Tricia. I can understand your wonder at your ancestors leaving, but maybe your grandfather had to move with his job. Shaun’s lasagne dish looks delicious and I’ve never thought of creating it quite like that. It’s a clever idea. What was the filling? Carol, happy you enjoyed the sunny shots. His lasagna was indeed unusually presented. I just checked in with him to ask your question about the filling. He recalls it having Ricotta cheese and peppers, along with the grilled corn on top. As for the dollop of green sauce, he’s trying to recall if it was similar to a pesto. It’s garnished with a sprig of dill. You’ve reminded me that I’m hoping to make a gluten-free lasagna version; must add the noodles to our shopping list. Thank you for your comment, and wish you a wonderful Wednesday! Thank you. It sounds delicious. Peter, it sounds as though a return to Paso Robles is in order for us, since we were only there for a day! Thank you for the recommendation to visit Justin. Looks like another pretty Paso spot. I’m pinning this for future reference. I’ve been wanting to go to Paso Robles for a while, especially since I love to explore wine regions. I have had the pleasure of seeing Turley’s winemaker, Tegan Passalacqua, speak twice at the Lodi Zinfest. In fact, I attended his presentation about historic vineyards just a couple of weeks ago. Hi Jenna, we were impressed with the quality of Turley’s wines, and after trying Croatian Zinfandel (where the grape originates) it was fun contrasting it with its California cousin. :) I hope you get a chance to get to Paso soon. Coincidentally, we were contemplating going to the Lodi Zinfest (I think I saw it via your site) but decided to go a bit farther along the coast. On a side note, we were thinking of coming to Sacramento for the Second Saturday event. I’m sure you’ve been to it many times? Truly beautiful work on this piece, Trish. Very informative and beautifully presented. Thanks for your kind words, Kevin. It’s fun exploring spots where creative people have worked their magic, and then weaving these scenes together into a story. :) Wishing you a wonderful weekend ahead!